In a likely top contender bantamweight matchup, Joseph Benavidez and Dominic Cruz will slug it out at WEC 42 on August 9th to determine who will be next in line for a shot at Miguel Torres’ title. Although this electrifying scrap has been rumored for quite some time, the organization just confirmed that the bout today, and that it will be taking place inside the Hard Rock Hotel in Las Vegas, Nevada. These two sluggers will be joining Torres on the card as he will not only be defending his strap, but his 17-fight winning streak against top contender Brian Bowles. 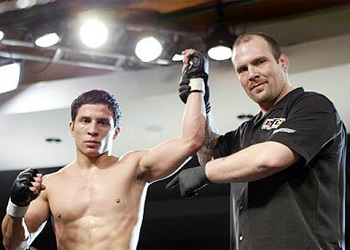 Benavidez, the talented protégé of former WEC featherweight champ Urijah Faber, was last seen taking a unanimous decision over Jeff Curran at WEC 40 in April. Cruz will be entering the fight at a slight disadvantage as his sole professional blemish was handed to him by Faber back in March of 2007. There is no doubt that Faber will share the tricks of Cruz’ trade to make sure his training partner emerges as the top dog to Torres’ title.